Eddie is coming back to America. Eddie Murphy is returning to his rightful place on the throne. On Friday, Deadline announced that the actor will reprise his role as Prince Akeem in the sequel to Coming to America. 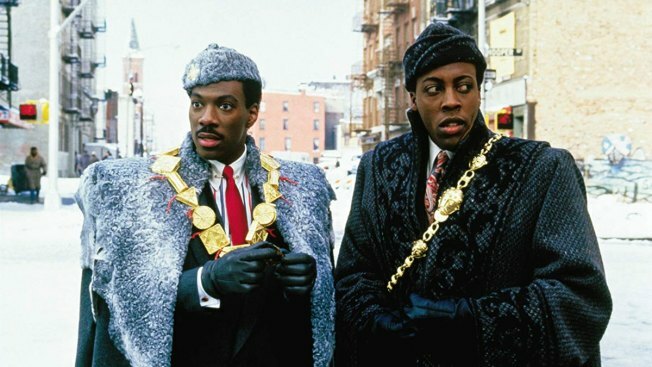 In a statement, the actor told the outlet, "After many years of anticipation, I'm thrilled that Coming to America 2 is officially moving forward... We've assembled a great team that will be led by Craig Brewer, who just did an amazing job on Dolemite, and I'm looking forward to bringing all these classic and beloved characters back to the big screen." In other exciting news, Kenya Barris, who is the creator of the show Black-ish, will be writing the screenplay. For those who need a refresher on what the 1988 blockbuster is about, Murphy plays an African prince who hopes to find a wife in the United States. However, since he is a prince he must go undercover in Queens to meet the woman of his dreams. The past few months are proving to be a whirlwind of exciting events for the 57-year-old. In November, the star and his fiance Paige Butcher welcomed their second child together, Max Charles Murphy. Their bundle of joy joined big sister Izzy Oona Murphy in the Murphy-Butcher household just in time for the holiday season. The family-of-four later reunited with the rest of the Murphy kids to celebrate and take a family portrait of all 10 of Eddie's kids. Bella Zahra, Zola Ivy, Shayne Audra, Miles Mitchell and Bria Murphy, who were born out of his marriage to Nicole Murphy, were present, in addition to his daughter with Mel B, Angel Iris Murphy Brown. Not to forget, Murphy's firstborn, son Eric Murphy with ex Paulette McNeely, as well as son Christian Murphy with ex-girlfriend Tamara Hood. And, Murphy and Butcher are currently engaged! Murphy proposed to the model in September, just months before their son arrived.